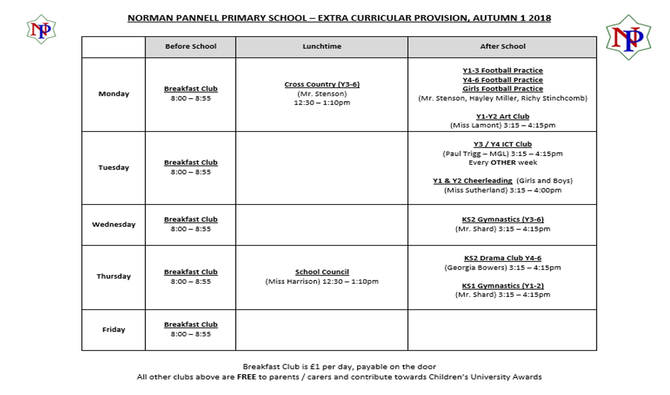 Please click on the link below to see the Extra-curricular activities timetable for this term. We believe that children really benefit from attending activities such as sports, art, drama etc. as they have fun, make friends and learn new skills. Letters for each club will be sent home - please fill in the permission slips and return them to school as soon as you can. Our after school activities are free of charge, ending at 4pm or 4:15pm. If you need your child to be looked after until later, he/she can go straight into our after school provision, which starts on Monday.